Forget the gym, this Tim Robards workout is for your living room. Tim Robards' top five tricks for getting a gym-worthy workout without leaving home. The gym? It has its downsides. Fighting for a car park. The competitive people who turn using the treadmill into a race. Getting judged for your choice of activewear. Actually having to leave the house. It goes on. Sounds familiar? You’re not alone. According to recent research commissioned by the NBN network, 62 per cent of us prefer to exercise in our living rooms rather than heading to a sweaty gym, thanks to the convenience and the fact that it’s, you know, free. Instead, many of us are swapping personal trainers for online video tutorials. It&apos;s a switch former The Bachelor, fitness expert and chiropractor Tim Robards is all for, creating two Virtual Trainer workouts to allow people to do just that. "I’ve worked with nbn™ to create two 30-minute workouts, using some of the most popular and interesting fitness trends available online at the moment – from my very own TRM power combined with animalistic moves to street workout and yoga – that will get you growling, stretching and sweating all at the same time," he says. "My favourite would be the animal walks… fun and challenging to say the least!" Tonight I graduated to the pink 3 kg dumbbells... #youcouldsaythingsaregettingprettyserious ???????????? Almost 3 weeks out of sling and 9 wks post surgery... Initially I had a moment of getting down about my injury, but then I opened myself to enjoy the journey that it would bring... Without it, I would not have experienced -having a complete stranger tie my shoelace ???? -walking everywhere and taking every mode of public transport, especially my ferry ride to manly!⛴ -Making me fall in love with Anna even more! Best support/nurse???? -forced me to slow down and become more present, not constantly 100 mile an hour???? Temporarily losing the ability to do so many things I loved, made me appreciate everything I had even more. I couldn&apos;t work, drive, train or even get dressed by myself! However there&apos;s always an equal amount of positive in every situation! I trained harder and more regularly than I ever had, even if it was a one handed spin class! If you&apos;re ever getting down on yourself and things look bleak, remember there&apos;s always positive in every situation, it just may not be staring you in the face... ???? Exercising in your onesie? We&apos;re convinced already. You don&apos;t need any fancy or expensive equipment either. According to Robards, existing household items you already own are all that&apos;s needed to get a gym-worthy workout without leaving the house. No, not for indoor tennis. "Grab two tennis balls and use them for rolling your spine and trigger point releases in muscles like glutes and rotator cuff (shoulder)," he says. "A chair is great for doing dips and squats onto," he says. "Two chairs can become your parallel bars for full body weight dips, ab exercises and a variety of chest building exercises." 5 exercises for your living room floor. Forget a personal trainer - a laptop and fast internet connection can be your best training partner at home. "With a wealth of online ‘how-to’ videos and fitness routines available on the internet just like my very own The Robards’ Method fitness program, you have access to the world’s largest database of workouts available," he says. 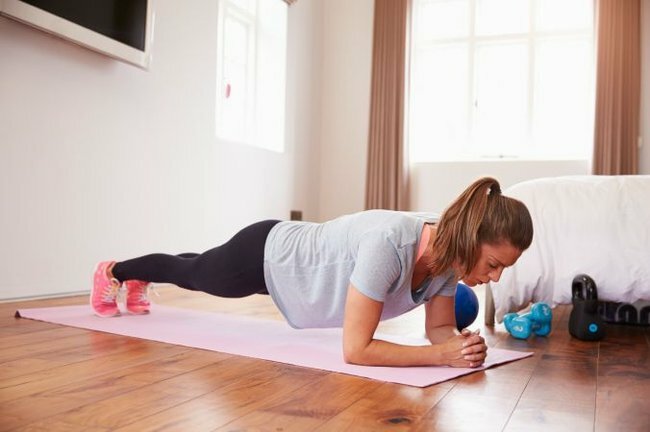 As tempting as a nap is, your beloved pillow can actually be used to take your workout up a notch. "Try using a thick pillow or two instead of a boss ball to challenge your balance for things like one legged squats and single leg deadlifts," he says. "The unstable surface is a great way to recruit more stabilisers and you won’t have to store away extra exercise equipment." There&apos;s one more option to turn your living room into a (temporary) gym. "A $50 doorway chin-up bar can turn any doorway into the ideal place to hang your Tim Robards Method rings when training inside, allowing you to train your back and biceps, which you will struggle with only floor type body weight exercises," he says. Ultimately, it&apos;s about not being intimidated by the thought of having to set aside hours a day to exercise. "Anyone can exercise, wherever they are, and this is exactly what this activity is showing – you don’t need a fancy gym membership, Australians all over the country, whatever their location can connect to a whole new world of fitness at their fingertips."